Our building first was opened as a restaurant on February 14, 1971. Today, antiques, historic photographs, newspaper articles, stock certificates and other elements of Visalia history adorn its walls. Its historical importance is well documented, and its future role in downtown Visalia's commerce is equally as vital. Lunch and dinner are served in The Oak Room, which once enjoyed the bustle of passengers awaiting forthcoming trains. Today, it is a place to relax and enjoy time with friends, family or business colleagues. Seventy-six bulbs illuminate two elegant chandeliers, imported from Spain. Beveled glass partitions from a New Orleans hotel create three intimate booths for two in the center of the room. Throughout The Southern Pacific Depot, stained glass from Italy is enhanced by depictions of railroad scenes. In The Dome Room, often available for dinner and special events, a gorgeous skylight incorporates hundreds of pieces of stained glass from Europe in an impressive design we cherish. A working locomotive light from The Southern Pacific Locomotive Engine 612 shines at the entrance to our bar, The 612 Room. A wide selection of wines and appetizers are offered. And as those trains pass through town today, we ring a deeply toned bell above the bar to honor past and present. We’ll ring it for your birthday party or anniversary, too. Just ask! Once a baggage-holding facility, the Conductor's Room now is a popular choice for family, church, club and business events. Its shape, open floor plan and private bar create highly adaptable event space. We welcome the opportunity to customize your event and its menu to your specifications. One settler, Nathaniel Vise, claimed much of the land that is now downtown Visalia. He never finalized the acquisition, but because of his early holdings, the settlement took on the name of Visalia. That was a reflection of the town of Visalia, Kentucky, named for his family. Tulare County was formed in 1852, and in 1853, voters chose Visalia as the county seat. Thus, unlike many towns in California's San Joaquin Valley, Visalia was not founded by the railroad. Yet early Visalians desired a railroad to transport passengers and commerce. Serious efforts began in the 1860s. A decade later, Visalia had an ideal opportunity: The Central Pacific Railroad was building south from Lathrop, and the Southern Pacific Railroad was building north from Bakersfield. Yet Visalia was bypassed when the railroads chose in 1872 to build Goshen, to the west. Visalia business owners were disappointed, so in 1874, they created the Visalia Railroad Co. to build a spur line between Goshen and Visalia. The line was completed by 1875, and the first railroad depot opened at Jacob Street and Goshen Avenue, near what is now Recreation Park. At the time, that was far west of town. Passengers had to rent buggies to meet the train. In 1893, a new depot was built at our location, the southeast corner of Oak Avenue and Church Street. Then, in 1897, the Southern Pacific Railroad purchased the Visalia-Goshen line. But there were problems: the depot was inadequate for the volume of freight and passenger traffic. In 1906-1907, passengers complained about having to wade through deep mud to get inside. Construction was delayed by heavy rains, so Visalians had to even more patient for a new depot. But the mission-style building mostly was finished in time for a Fourth of July party in 1916. Operations officially began that fall. 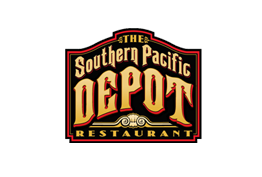 When The Southern Pacific Depot opened at noon on September 12, 1916, Mr. W.R. Spalding, the prominent lumberman in Visalia, purchased the first passenger ticket. During Visalia's railroad heyday, four railroads served the city with 32 trains a day. The Visalia Electric Railroad, which operated exclusively within Tulare County, also utilized Southern Pacific's depot and tracks. But along came motorcars, and trucks, and airplanes. On Oct. 3, 1940, the last Southern Pacific passenger train, a passenger express and mail car, served Visalia. Mr. Kenneth Uhl, a staff writer for the Visalia Times-Delta newspaper, noted the subsequent departure of Train 57 that autumn day: "How the loaded buses, the speeding shining automobiles and the cocky airplanes must have chuckled at the last gasp of life from little old Number 57!" The first commercial aircraft, operated by United Airlines, would arrive in Visalia a mere six years later. "The tables are elegantly set and the wait staff are attentive without being intrusive. My husband ordered the pork chop which was very thick and juicy with lots of great flavor. I had the salmon over the spinach with rice. It was perfectly cooked with the outside seared and the inside flaky. Delicious!"